D.C. Bike Shelter Gives Commuters A Ticket To Ride Commuting by bike is cheap and environmentally friendly — but it's not so easy to park securely. 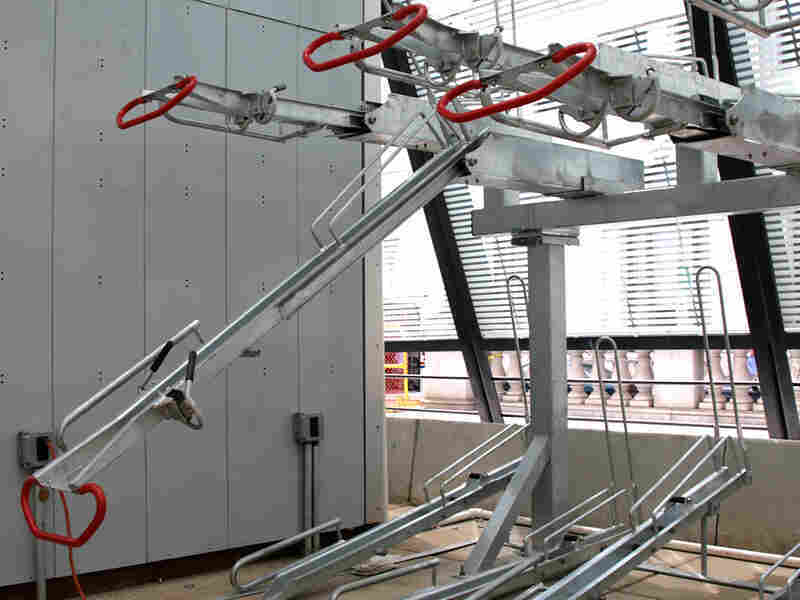 A new bicycle storage system in Washington, D.C., aims to solve that problem for commuters who take the train. The Bikestation will house 130 bicycles. A Half-Football? A Bike Helmet? The Bikestation's exterior has drawn many comparisons. Just outside Washington, D.C.'s central train station, construction is under way on a sleek, modern, glass-and-metal bike garage. 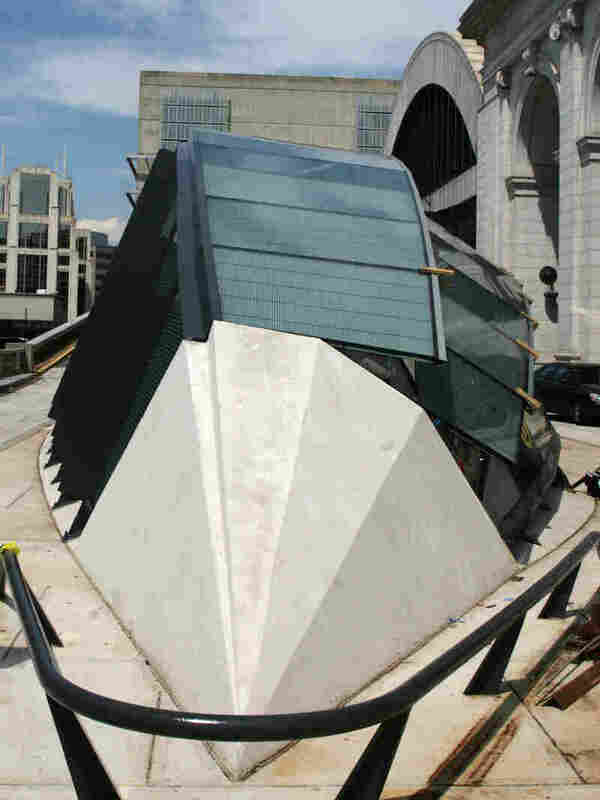 "Some people say it's a half-football or a shell," says Mazen Soueidan, the project manager. "It has four sides [with] scalloped shells that overlap." Once completed, the Bikestation will hold 130 bikes, lockers and a small shop for repairs. Located next to the Metro subway exit at Union Station, the system will provide secure bike storage for commuters who want to cycle through Washington once they arrive from "feeder" cities like Baltimore. Of course, part of the appeal of bicycling is convenience — you can lock a bike to pretty much anything. 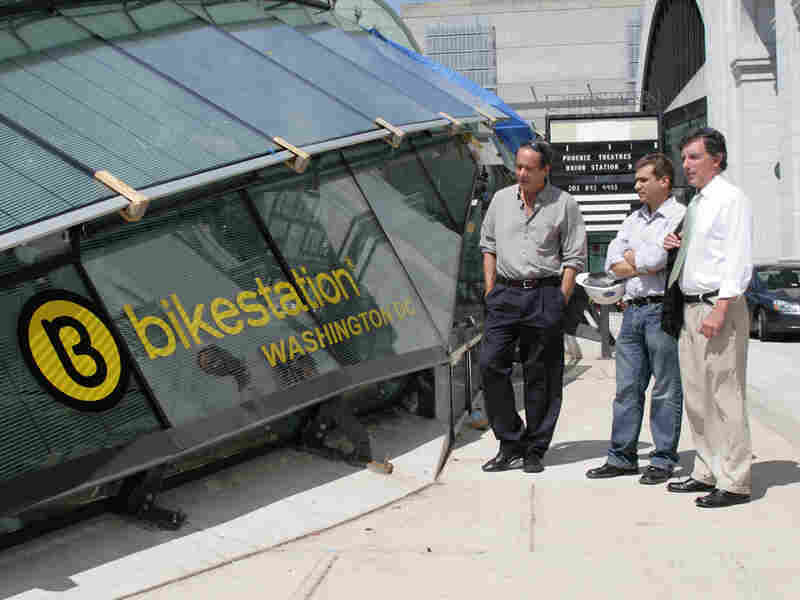 Architect Don Paine (left), project manager Mazen Soueidan and Bill Gallagher of KGP Design Studio inspect the Bikestation weeks before it opens. But if you lock your bike to a parking meter, you might come back to find it's missing a seat or wheels, or it's just gone. Soueidan says theft was an issue even while building the bike garage. "The superintendent actually had his bike here once and he didn't lock it, he was just gone for five minutes — and we actually saw the bike take off," he said. In addition to security, the idea is to reduce traffic and encourage exercise — and there's some evidence to suggest that it works. An annual survey of Bikestation users in California has shown that 30 percent previously commuted by car. "This is a monumental paradigm shift for the typical American," says Don Paine of Washington's KGP Design Studio, lead architect on the design. Set to open in October, the Bikestation will require either an annual membership or a daily usage fee. Paine says introducing the system to Washington is part of a larger shift toward "dispelling the notion that the car is an essential part of our daily lifestyle." John Ciccarelli of Bicycle Solutions in San Mateo, Calif., agrees. "What's growing is acceptance that the bicycle is a mode of transportation as well as recreation," he said. Levered arms inside the bike garage allow bicycles to be stored one on top of the other. That's long been accepted in countries in northern Europe, like Denmark and the Netherlands, which have been developing their cities around bikes since the 1970s. "If you look at the comparable facilities in Germany or Japan," says Ciccarelli, "you're looking at something like 3,000 to 4,000 bicycles." For now, Washington's Bikestation will hold 130 bikes inside, with additional spots outside.